Many of our first introductions to Route 66 likely came from the summer we spent reading John Steinbeck’s The Grapes of Wrath for high school English class. Visions of dust-covered roads and crowded migrant camps dotting miles of highway are typical images that come to mind, based on our limited understanding of the once-great roadway. Though Steinbeck himself coined the term “The Mother Road,” his iconic story mainly followed the lives of the Joad family, led by protagonist Tom Joad. Joad’s trials and tribulations have colored perceptions of Route 66 for nearly eight decades, leaving a tendency toward understanding the experience in a largely male-focused light. Though the fictional undertakings of characters like Tom Joad emulate the contributions of men who traveled these roads in real life, there remains an entire demographic whose stories and roles along the Route have traditionally been overlooked. The women who lived, worked, and often raised families along the 2,400-mile stretch of roadway made an impact in ways that are just now being explored. Filmmaker Katrina Parks has spent the past five years dedicating herself to uncovering these exact stories. One of her earlier documentaries, The Harvey Girls: Opportunity Bound, inspired Parks’ interest in the tales of the thousands of young women who worked as waitresses in restaurants along western railways. Entrepreneur Fred Harvey grew his chain of Harvey House restaurants by employing women of “good character” to serve in eateries across the Atchison, Topeka & Santa Fe Railway, and the stories of these women are numerous. Now through a grant with the National Park Service’s Route 66 Corridor Preservation Program, a partnership with Cinefemme, and the research support of several state Humanities Councils, Parks has launched “The Women on the Mother Road.” Initially part website and part oral history collection, the project has morphed into a documentary that includes interviews with diverse women who experienced life along Route 66 in a variety of ways. The documentary will become one of the few public records to preserve women’s history in this context, and its unique perspectives offer a look at the Route 66 experience that is not often considered. Using her camera lens to give focus to the stories of the past, Parks has helped to unearth the stories that made the Mother Road what it is today. We spoke with Parks to discuss her exciting and groundbreaking work thus far. 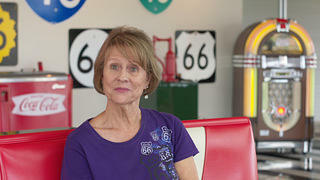 Pat Smith sits down for an interview at the Route 66 Museum in Clinton, Oklahoma. 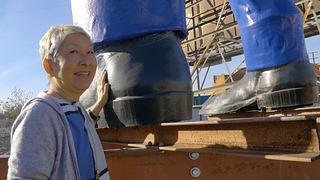 Amy Inouye poses for a photo with Chicken Boy, the statue she rescued on Route 66 in Los Angeles, California. How do both the documentary and the oral history project work together for The Women on the Mother Road? It was actually through my first women’s history documentary, The Harvey Girls, that I was introduced to Route 66. After the railroads went into decline, Route 66 in some ways took the place of Harvey Houses in many communities, and these women forged interesting careers for themselves on the Mother Road. I started exploring the ways these women’s lives interacted, and I was really surprised by how many ways their lives were touched by Route 66. My idea for the website and gathering the oral histories was always that I would [eventually] make a documentary film. In some ways, I’ve reverse-engineered the process that I did with The Harvey Girls documentary. What I found was that when I would take finished film to these railroad towns, new Harvey Girls would come out of the woodwork. And I would want to do film interviews with them, although the film itself was done. That grew into an oral history project. This time, I’m kind of doing the reverse. I’ll go to these towns or I’ll do this firsthand research in Route 66 communities, and I’ll be building an audience and then showcase my research through the website. That way, even my research will have a product, if that makes sense—somewhere people can go where they can connect with me and they can see what I’ve gathered. What’s so wonderful about this project is how diverse the stories being told are. Was this kind of inclusivity intentional on your part as a filmmaker? It’s kind of fundamental to my interest in filmmaking and history, because not only have women been excluded from history, but so have all these diverse groups in our country, especially when you look at the American West. Virginia Scharff has this amazing quote about how, “The tale of the American West has been told as a story of men in motion,” and for the most part white men in motion, so I’m interested in a much more expansive and inclusive look at the history of the American West and Route 66 as part of that. It was also, to some degree, the approach I took to The Harvey Girls. I wouldn’t have made that film if I was just focused on the Harvey Girls of the 1890s, who were mostly white or identified as women from the East and Midwest coming to “civilize” the country. I was really interested in finding new angles of looking at the Harvey Girls’ experiences. The Mitla Cafe in San Bernardino, California. 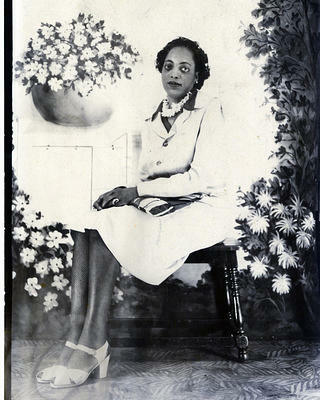 Businesswoman Alberta Ellis poses for a photo in Springfield, Missouri. What do you think Route 66 symbolized for women? Do you think their experiences beyond the domestic sphere opened up new possibilities for them and for other American women? I think that’s kind of the ultimate message of the project, how women—how diverse women—found opportunities on Route 66 and contributed not only to their families’ lives, but kind of changed the West for generations to come. By contributing to the kind of Main Street environment of these small towns communities, I think you can make the case that they were setting an example for future generations. And sometimes, in a very concrete way, they were opening doors for their children and grandchildren. Have you learned anything surprising by working on this project? Initially, I had this idea of the more stereotypical images of Route 66, like the family in the car filled with stuff going on road trips, or waitresses working in cafes. I was surprised to find archeologists and anthropologists and politicians. When I initially started, I was surprised at how easy, in some respects, it was to find stories that were different from what was out there. [The project] has taken me to places in this country that I wouldn’t have otherwise had the opportunity to go to. That’s one thing about Route 66: When you were making these epic trips across the country in the past, you were stopping in small towns and staying out and talking to people. I think that’s something we’ve kind of lost with the freeways—this communication with people who are so similar and different to us. How do you hope that this project will help engage communities and tell the stories of the past in a more complete way? What do you hope audiences will take away? I certainly hope audiences will be inspired to do this kind of work and to see the possibilities of historic preservation—what it can mean to local communities and more broadly. One of the amazing things about Route 66 is that you can still travel it today. You can really make the case for the importance of historic and community preservation, and what it can do for these small towns, and how much joy it brings visitors. People are hungry for personal stories of the past. 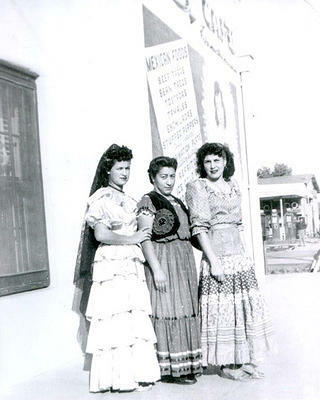 Beyond anything else, that is what brought me to Route 66: the personal narratives of these women. I think it adds so much understanding to place, and how character and place are interconnected. Learn more about The Women on the Mother Road project by visiting its website or Facebook page. If you have a story you would like to share relating to this project, connect with Katrina Parks and learn more about the documentary. Abigail Bashor is an Editorial Intern at the National Trust, with a focus on women’s history. She believes that every person and place has its own story waiting to be told, and is excited to help uncover these fascinating perspectives.